Amazing is an understatement when describing the deliciousness that is one of Mrs. Prindable's handmade gourmet apples. Drenched in buttery caramel and then festooned with layer upon layer of chocolate (milk chocolate! dark chocolate! white chocolate! 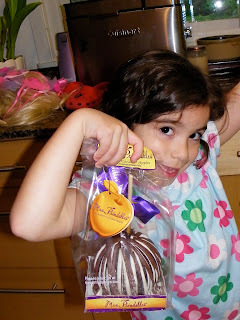 ), the Triple Chocolate Jumbo Caramel Apple Gift that we sampled was unbelievably decadent while retaining the fresh, crisp tang of the granny smith hidden within. Even the box it came in looks indulgent! Look at the pretty purple box and tell me you wouldn't want to see what was inside! I must admit that I contemplated hiding this package away since it came while Roo was in school and Jasper was napping. I did unwrap it but I was a good mommy and put it into the refrigerator to save for a family taste taste. It was rough, waiting. Still, I thought the kids should get to see how pretty the Mrs. Prindable's Triple Chocolate Jumbo Caramel Apple was before their mother butchered it. Literally. Jasper had never seen such a thing so he was a bit skeptical. Apples are good by themselves. So is chocolate. Would it work together? He wasn't sure. Aside from the fact that Mrs. Prindable's handmade gourmet apples taste like heaven on a purple-ribboned stick, they slice up beautifully. Even with me wielding the proverbial blue steel, the apple and caramel and chocolate all stayed intact and presentable. Which means anyone could do it, basically, and get oohs and ahhs from the hungry crowd. Even fancy schmancy types. 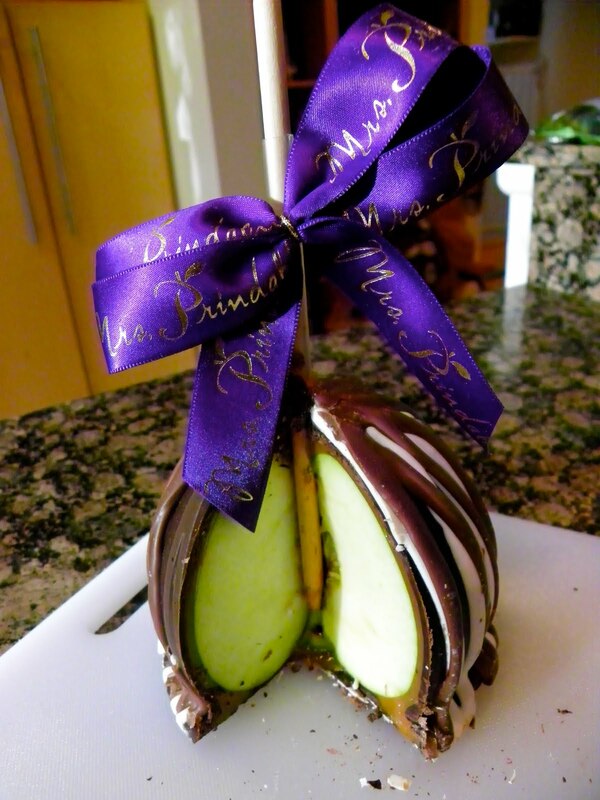 If, for some incomprehensible reason you are apple-phobic, Mrs. Prindable's also offers an array of handcrafted confections that don't involve fruit. There are pretzel rods dipped in Mrs. Prindable's glorious caramel and assorted toppings as well as more traditional gourmet caramels and nut clusters. 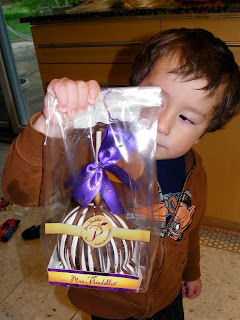 The object of my affection lust is Mrs. Prindable's Triple Chocolate Caramel Favors which is essentially the same thing as we tried, only sans the apple and boosting up the caramel. Holy cow! 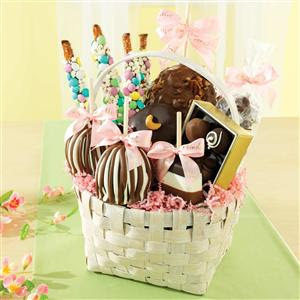 These gorgeous Mrs. Prindable's Gift Baskets would be great for teacher appreciation and– hello, family!– Mother's Day giving. Follow Mrs. Prindables on Twitter and Facebook to learn more. They have regular giveaways, people! 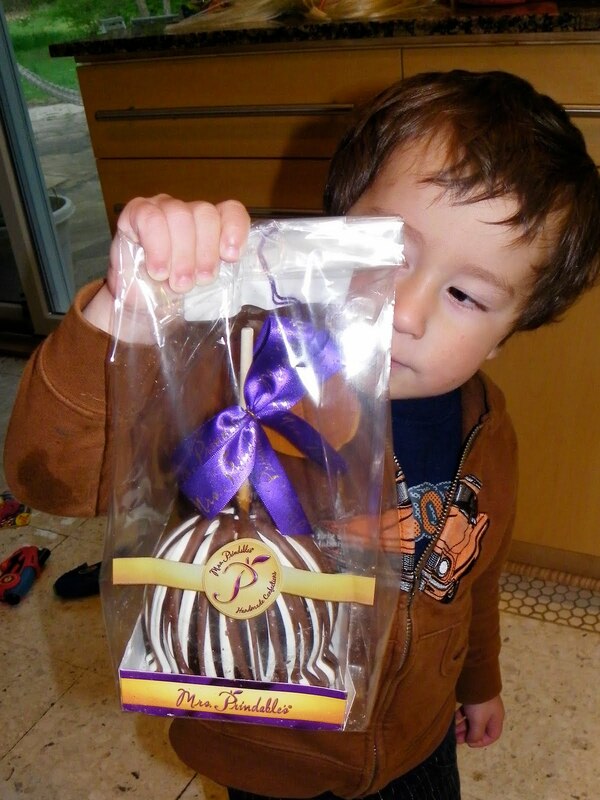 Disclosure: Thanks to Mrs. Prindable's and Mom Impact, e received the Triple Chocolate Jumbo Caramel Apple Gift shown above to facilitate this review. If it wasn't totally delicious, however, we would have mentioned it. Do you think they'd send more if we said we hated them? Hmm… totally joking, FCC. These are the best! My mother-in-law makes knock off ones that are good, but Mrs. Prindable's are over-the-top indulgent. Shame on you, now I want one and am going to the fridge for chocolate chips. As if that's a compromise. We NEED a giveaway of these! Come on, Mrs. P! Or a coupon code would be good, too.